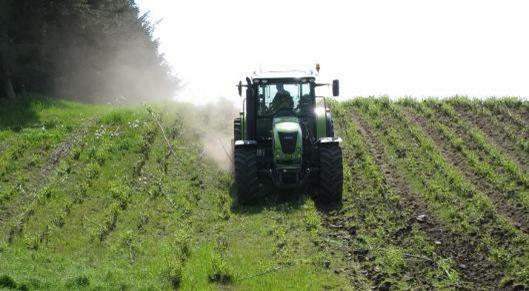 The NB LINE CULTIVATOR has over the past years been used in both new and old plantations with impressive results. It leaves the soil almost free from weeds - and any stems left on the ground will be destroyed. One of the most important factors to ensure high biomass yield in SRC, is weed control. This is especially important during establishment, but also after each harvest, when the crop is relatively open, and leaves room for the weeds. It is mainly perennial weeds like couch grass, mugworth, thistles, nettles etc which can become a problem. If you are using sewage slude or manure, it is important to be able to work this into the soil, to make the best possible use of the nutrients. After harvest it takes a more heavy duty type of cultivator to do the job, as there will albways be some stems left on the ground that was not collected by the harvester. Please observe the stems lying in the field to the left. During establishment, a line cultivator for vegetables can be used. But the result is not always very good, as this type of machinery is intented to be used in relatively loose soil, not in a perennial crop that is only cultivated once or twice a year. Nordic Biomass could not find a line cultivator that fulfilled the need, and therefore it was decided to develop a machine dedicated to cultivating SRC crops. The result of this work is the NB LINE CULTIVATOR, which is the only line cultivator on the market which has been constructed especially for SRC crops. For priceindication, not available at the moment. For technical specification on the NB STEP NEW GENERATION, press here.